To that end, the authors of a new white paper on achieving competitive advantage in the post-acute space argue that adopting CFCM has the potential to not only improve operational efficiencies and reduce expenses — particularly for facilities willing to pursue higher-acuity patients — but it can also help create a work environment that actively works to improve and maintain nurse job satisfaction. “As quality of work life has an important impact on attracting and retaining employees, it is necessary to pay more attention to the nurses’ quality of work life and its affecting factors,” write the authors of a 2014 study on the nursing work environment. In that study, researchers found “no significant differences” among nursing job satisfaction and factors like salary, age, gender, or marital status. Rather, the factors affecting nursing job satisfaction centered on variables like education, experience, and facility type (and its score regarding quality of working life). In other words, nursing job satisfaction is primarily a workplace concern, rather than a geographic or demographic one. And contact-free continuous monitoring offers the chance to improve and maintain the quality of the nursing work environment with an easy-to-use tool that simplifies workflows while giving nurses the power to conduct patient care more efficiently and effectively than ever before. How, specifically, do the contact-free continuous monitoring tools like those offered by EarlySense accomplish this? The white paper authors offer insight into four key areas. Alarm fatigue is one of the most frequently listed downsides of the nursing profession, the authors note. Sophisticated contact-free continuous monitoring tools help fight alarm fatigue by offering alerts that are smarter and more contextual, while empowering nursing staff to better assess the severity of any potential emergency without undue distraction. 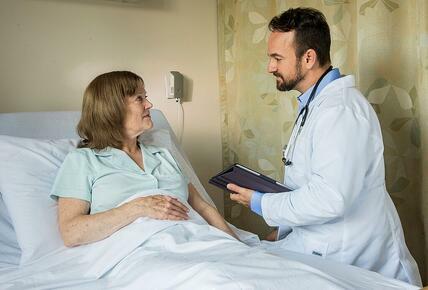 Nurse-to-patient ratios in post-acute facilities are higher than in hospitals, the authors point out, and nursing skill levels are lower. Contact-free continuous monitoring can help offset this issue by increasing the capacity of the nursing team, especially in the treatment of complex patients. Along with alarm fatigue, “being unable to perform at the top of their license,” is the most frequently cited complaint of the nursing profession, the authors note. Contact-free continuous monitoring can help alleviate this complaint by simplifying workflows, improving efficiencies, and automating mundane tasks, thus letting nurses focus on the more meaningful aspects of patient care. It also offers nurses “the opportunity to provide more direct patient care than ever before by delegating tasks that are more efficiently and routinely being performed by CFCM,” the authors emphasize. With contact-free continuous monitoring, post-acute and skilled nursing leaders and administrators can help correct this challenge, putting in place an effective tool for not only improving outcomes both clinical and financial, but also for building a better nursing work environment. Interested in learning more? We invite you to download our complimentary white paper here, or contact us here for more details on how EarlySense can help your facility improve its nursing work environment.